Frey played every game as a true freshman, and continued to play in every game during his 4 year career at Nevada. Last year he led the team with 5 interceptions and 21 pass break ups. Possessing 4.46 speed, he was selected 1st Team All-WAC as a senior. He helped Nevada improve it’s pass defense effenciency, ranking No. 28 in the country. He’ll provide competition to veterans Kelvin Hayden and Jonathon Wilhite, and will challenge for the Bears 6th cornerback spot, and possibly at back up nickel. 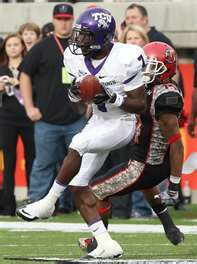 McCoy led the Mountain West, and ranked 6th nationally last year with a kickoff return average of 30.6 yards. Selected by Cbssports.com and Yahoo Sports for All Amercian at kick returner, and also took home the Mountain West Special Teamer of the Year award. Defensively, he won the Poinsetta Bowl Defensive MVP trophy with his interception and 24 yd return for a TD. He ran a 4.42 at his Pro Day. He, along with Frey (see above), will battle it out for the 6th cornerback position. Frey has the size advantage over him, but McCoy could be more valuable because of his return skills. Most likely, I see a practice squad player here, and could be activated to the roster with an injury to Weems or Hester. This is a little bit of a surprise. I really thought the Bears would go with a DT here, especially with Mike Daniels (who the Packers later selected) and Jared Crick still on the board. Rodriquez is a hybrid back, and can fill the FB role when needed. He’s got great speed for his size clocking in a fullback best 40 time of 4.58 at the Combine. Also uses his 36″ vertical to his advantage. I runs a great FB flat route and can fly on seam routes when lined up at TE. 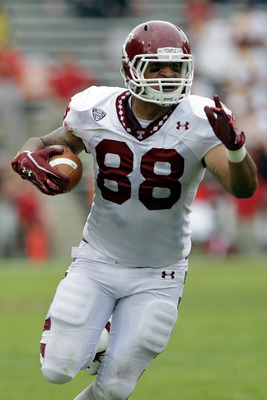 He often gets compared to Patriots TE Aaron Hernandez. Let’s hope he plays like him too. 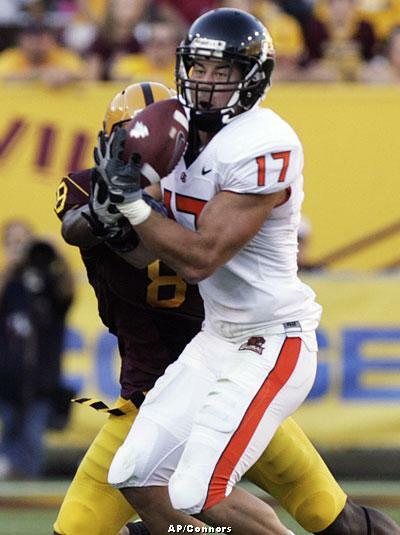 He’ll create competition for Tyler Clutts at starting FB, and should overtake Kyle Adams for the Bears 3rd TE spot. The Bears tried to use Adams in that hybrid role last year with little success, and Clutts just doesn’t add much value in the passing game. Overall, I like the thinking behind this pick, but I question this pick in the 4th round. Without having a 5th round pick, the Bears must have felt he wouldn’t be there in the 6th. He was projected to go in the 5th-6th round. Nfldraftscout.com did have him ranked as the #1 FB prospect though. We’ll have to wait and see how this plays out. I don’t know if Phil Emery has ever been to Vegas, but I do know he likes to gamble. With the 79th overall pick, the Bears either selected a multiple Pro Bowl safety, or a special teamer that will have an injury plagued career. Hardin missed his entire senior season with a fractured shoulder, and had injuries to his wrist and hand in the previous years. He was healthy enough to play in the East-West Shrine game last year though. Why would the Bears take such a gamble on this kid? Because he’s 6’3”, 219 lbs and runs a 4.38 forty. He has a 35-1/2” vertical and put up 24 reps of 225 lbs. That 24 reps is 3 more than what he could do before the shoulder injury. He played CB in college because of his speed, but the Bears will use his size and convert him to safety. Using that size, speed, and coverage ability, he would be the perfect candidate to cover elite receiving TEs, like one Jermichael Finley. Hailing from Honolulu, Hawaii, Hardin is a very bright, hard working guy. He’s a 2 time PAC -10 All-Academic selection, and graduated with a degree in Business Management. He certainly looks the part of an NFL safety, now just needs to prove that he can stay healthy. He will challenge Major Wright for the starting job, while contributing immediately on special teams. Emery is certainly rolling the dice on this one. Bears fans just hope he doesn’t roll snake eyes and craps out. For now anyway, as long as Emery is still shooting, I’m betting the pass line every time. The Bears traded their 2nd and 5th round picks, moved up 5 spots in the 2nd round, and got Cutler another target. Jeffery was at the top of everyone’s draft boards before the Combine, but the rumors of weight issues and potential bust status dropped him into the 2nd round. His senior year he played at 233 lbs, and while averaging over a TD a game, looked slow on tape. Jeffery shed the extra weight and came to the Combine at 216 lbs, resulting in a 4.48 40-time. If the Bears can keep him away from the chicken wings, and his weight around 215, they might have struck gold. He possesses a 36-1/2” vertical jump, and 10-1/4” hands. I’m sure the Bears will pencil him in at the Z-wr, across from Brandon Marshall, moving Hester and Bennett to the slot. This pick now gives Cutler 3 WRs, yes 3, that are 6’2” or taller. Bears will most likely keep 6 WRs this year: Marshall, Jeffery, Bennett, Hester, Thomas, and Weems. Sanzenbacher will most likely be cut after camp, and it looks like Knox will start the season on the PUP list. Not sure if Jeffery will start immediately, but will certainly use his size and vertical to contribute in the red zone right away. The Bears needed to address the WR position in the first 3 rounds. Emery has now done that. Now let’s just hope his player evaluation is as good as advertised. Well, where do I start? It was a little bit of a shock to me. I was thinking that McClellin was probably going to the Patriots at 27 or the Packers at 28. 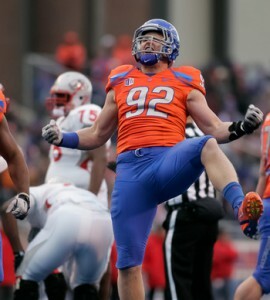 And rumor has it both of those teams were looking at trading up to draft a DE, possibly McClellin. After the Bears picked, the Pats did end up trading up to select Chandler Jones, the guy I thought the Bears would take. Jones along with Whitney Mercilus seemed to be the popular pick at 19 amongst Bears fans, including myself. But I’m willing to give this country bumpkin a shot, unlike a majority of meat head Bears fans. Oh, and I loathe those idiot fans that hate this pick for the simple fact that they don’t know anything about him, or they thought Riley Rieff, an LT that is projected to play RT, would have been a better option. After spending a few minutes educating myself on Shea McClellin, I started to really like this pick. He reminds me a lot of Clay Matthews, minus the gay flowing locks and steroid use. He has a similar style of play and relentless pursuit to get to the QB. Some people just have that knack for getting in the backfield, and Shea has that. McClellin actually ran a slightly faster 40 time at the Combine than Clay did too. 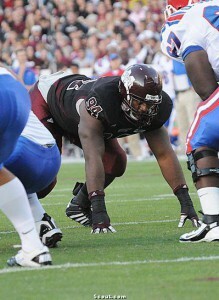 All I know is that I’m happy that the Bears used their 1st round pick on a pass rusher. Only time will tell if this was a great pick or not, and I’ll be keeping an eye on Whitney Mercilus in Houston, and Chandler Jones in New England to see how this selection plays out. But for now, I’m willing to give Emery the benefit of the doubt, and be excited for our farm boy sack specialist. Bear Down! I believe the Bears will use the first 3 rounds to address defensive line, safety, and wide receiver. It all depends on who is on the board at the time they pick, and who has the highest grade, will determine the order that they’ll pick players for those positions. Now they might make an audible and select a TE or CB if a certain player falls to them. Sorry, but I just don’t see the Bears addressing the OT position until later in the draft. And I’m not even sure if they’ll bother with taking a OG or a C since they have an entire team full of them already. Teams with the best passing game, along with the best pass rush wins games and championships in this league now. Also, in Lovie’s defense, there is a lot of pressure put on the safety position. That’s why I see the Bears addressing those positions (DL, WR, S) with their first 3 picks. I’ll have a better feel for their 2nd and 3rd round picks after round 1 is completed tomorrow night. The Bears need to add another pass rusher opposite Julius Peppers. By not getting one in free agency, the Bears will now have to turn to the draft for some help. Let’s take a look at some prospects. Coples has the size and strength to excel at the next level. He has an excellent bull rush and can simply overpower opponents. Explosive off the snap, and has the flexibility to dip and rip around the edge. Needs motivation since he always doesn’t play with a high motor. Not considered a “fierce” competitor, and sometimes takes plays off. Could be a boom or bust pick, but the Bears might take the gamble if he’s still on the board at 19. Motivated and works hard every snap. Has speed off the edge, and uses second or thirds efforts to get to the QB. Led the nation in sacks last season with 16 and forced fumbles with 9. 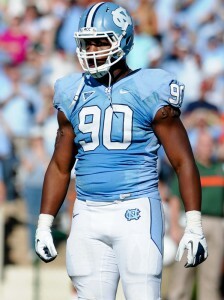 Not a great run defender but would be a great asset as a situational pass rusher. While being a versatile athlete, some wonder if he was a one year wonder. 50/50 chance if he’ll still be on the board at 19. 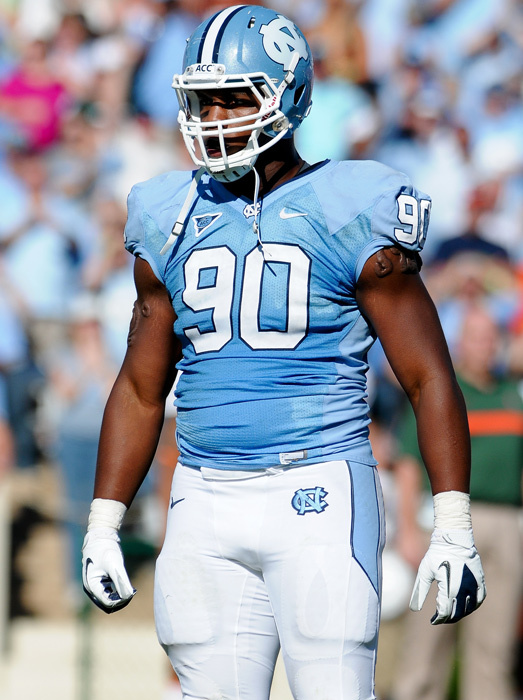 First team All-ACC last year with 10.5 sacks. Uses his initial quickness and long arms to gain the edge. Has a good closing burst. Not great versus the run, mainly a one trick pony. Will have to put on some weight to routinely play in a 4-3 front. Projected to go late 1st round or early 2nd round. Might be a reach for the Bears at pick 19, but would be a steal if he’s still there at pick 50. Jones leaves school after his junior year with 10 career sacks. Times the snap well, and has a quick burst off the ball. Athletic build and plays with urgency. Can sometimes be washed out by a strong handed blocker, and doesn’t turn the corner consistently. Has the frame and build to add weight and be really productive starter at the next level. Will be selected in the 2nd or 3rd round. Converted linebacker, Cam is still learning to play with his hand in the dirt. Quick at the snap, accelerates low and with power. Has the ability to shoot the gap consistently. Good against the run, tracking ball carriers across the field. Not a natural pass rusher, and will need coaching and technique. Because of a knee issue last year, he could fall to the 3rd round. The 2012 NFL draft is just around the corner. The Bears are still looking for a true #2 WR. I’m guessing they will take one in either the 1st or 3rd rounds. Let’s take a look at some prospects in those rounds. Floyd is a big, physical receiver with terrific body control. Doesn’t always create separation, he’s more of a “go up and get it” guy using his 36.5” vertical jump when needed. Not labeled as a burner, but did impress a few people by running a 4.47 40-time at the Combine. Probably the best blocking WR in the draft also. Floyd could go in the top ten, almost for certain in the top 20, so I don’t expect him to be there when the Bears pick at #19. Wright is a burner who can get behind the defense in a hurry. Had a horrible Combine 40-time, but had a strong showing running a 4.41 and 4.46 at his Pro Day. Can haul in the acrobatic catch, and is explosive in the open field. He’s quick in and out of cuts, creates separation. He just has a knack for getting open. He will still likely be on the board when the Bears pick at 19, projected to go late 1st or early 2nd round. Hill impressed scouts at the Combine by running a 4.36 40-time. He is a phenomenal athlete, but is still very raw as a receiver. Ran a really limited route tree in college, and doesn’t have much for stats because of Georgia Tech’s limited passing game. Could be a diamond in the rough, or possibly a complete bust. Only time will tell, but some team may take a chance on him in the first round. I don’t see the Bears taking him at 19, but may move up in the 2nd round if he’s still on the board. McNutt is still maturing as a route runner, but is fearless in traffic. Ran a 4.54 at the Combine. Makes up for his lack of speed by being savvy, and using his 37” vertical and his long arms to come down with jump balls. With good coaching, could become a reliable #2 WR for years to come. If he’s still on the board when the Bears pick in the 3rd round, he may be hard to pass up. Toon is a smooth route runner, and has great hands. Son of old Jets WR great Al Toon. He knows how to create separation, and can get off the line in press coverage. Also a willing blocker. Ran a 4.43 40 at his Pro Day, and has a 39” vertical. His downfall is his durability. His dad retired after 7 seasons in the NFL because of concussions, and Nick has already had some concussion issues, along with lingering foot problems. Look for him to come off the board in the 3rd round.